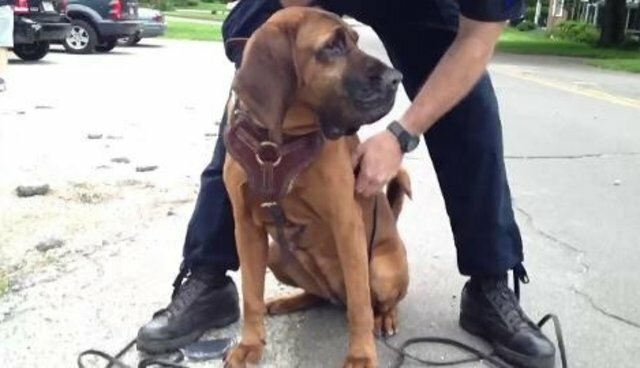 A four-year-old boy who went missing after wandering from his home in Indianapolis has been found safe and sound, all thanks to the incredible nose of a lovable brown bloodhound, named Grace. Police and volunteers had been scouring the area where the toddler disappeared, but despite being assisted by two helicopters overhead, they failed to track him down. As night settled in and the hours passed diminishing the child's chances of survival, Grace stepped in to save the day -- tracking the missing boy's scent until she finally found him cowering in the middle of a cornfield in the knick of time. "He got very, very far," says Grace's handler, Indianapolis Metro Police Detective Sgt. William Carter. "You don't know what the child can be exposed to: predators, the elements, water, obviously." But this isn't the first time Grace's remarkable sense of smell has been a lifesaver. Over the years that the seven-year-old dog has been called into duty, she's come to the rescue of several missing persons. Just last year, she even managed to track down an abducted infant based on the scent from a single article of clothing. "The mom had a sock that she had in the bottom of a diaper bag, and that's what we used as a scent article," Carter told The Indy Channel. "[Grace] tracked it to the building where the individual was inside with the baby." Incredibly, Grace has no formal training in search and rescue. Sgt. Carter, who adopted Grace as a puppy, was inspired to teach her how to find missing people after a lost child was found dead despite an exhaustive search effort. "At that time I was thinking that had to be something, some means, some tool, something that we could use," Carter says. Although he's not compensated for the many hours he spends each month training Grace to do what she does, the reward for Carter's work with his talented bloodhound is nothing short of priceless.